Marty and I are heading to Australia for 10 days, so probably won't post until I return. The second day of rain missed Chennai, so things are getting back to normal---lots of flooding in the city and downed trees, but most is cleaned up now except for the most severely hit areas. We are on back up internet (wireless card) because the broadband is down. Ironically, we had it all through the storm and it only went down during the cleanup---although we still have phone service. Chennai is getting a dose of what Mumbai got a couple of months ago. A low pressure area has developed off the coast and is pelting us with a relentless monsoon rain. We've already gotten 27 cm of rain, with more to come. This is still far short of Mumbai (over 90 cm), but the rain is forecast to last another 36-48 hours. I turned around and came back this morning rather than try to get into work, and we shut the factory down about 11 a.m. Even at 8:00 a.m., at points along the GST road, the water was knee deep. We had to take a detour to get to the house because a tree had fallen in the road. Roads are built right around trees here, and they pave right up to the trunk, so the roots don't get enough water and therefore don't anchor the trees solidly in the ground. More have collapsed since this morning, and a number of roads are blocked. So far we still have power and internet, but I'm writing this while I can---later on, they're predicting up to 40 mile per hour winds. Power has either been lost or shut down in several points in the city. This will likely delay our planned trip to Australia --we were scheduled to leave Saturday night. Some flights are still departing Chennai, but all inbound ones are diverted, and the trains are also shut down. Back in the spring I wrote about our long journey to membership in the Madras Club, which like many things in India, takes time, patience, and connections. Since the first of July, however, we have been members and have used the club often for the pool, walking track, library, bar, poolside cafe, and events--the last of these being a jazz night featuring what passed for pretty authentic Cajun cuisine. It's less than a five minute walk from where we live, so it's very convenient to go there for lunch or dinner as well as just to hang out. This afternoon Marty was taking a nap, so I went over for lunch--yellow dal or lentil stew and Indian bread---and caught up on magazines in the library. 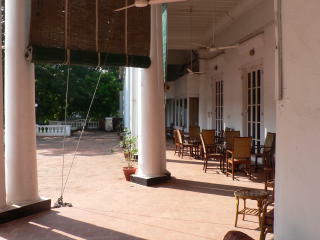 The club dates from 1832, the days of the British Raj , and was of course for men only. 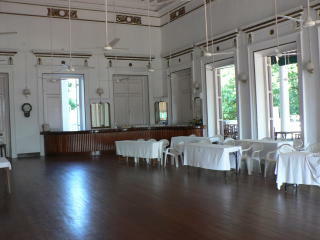 Its grandeur and open spaces, the billiards room, the special wood touches in the bar...all remind me of the bookend scenes in "Out of Africa" ----the first where Meryl Streep tries to enter the bar in search of her fiance and is escorted out, and the last where the men invite her for a drink. Several years ago, the Madras Club merged with the Adyar club, another British enclave, and found its present location on the Adyar River, next door to the American consulate compound. I suspect that the club's emphasis on protocol, not to mention the pomp and circumstance, has remained intact from its early days. Membership required several letters (no e-mails accepted) and attendance at two different cocktail receptions. The one part of the club that we have not tried is the formal dining room, since it requires a coat and tie for men (women need only be "decorous" in attire). One night about two weeks ago Marty and I went over on a Sunday night and thought we would have a leisurely cocktail in the main bar (next to the dining room) before going to the poolside cafe. It was not to be. Marty had worn his sandals and socks and sandals are not allowed for men. So we had to "get upping" , as Leela would say, straight over to the cafe. The next time we went, Marty wore his Reeboks---far less decorous, but legal. 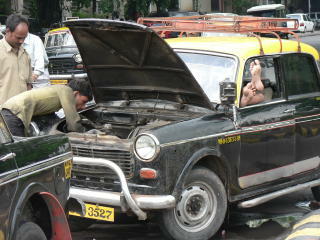 Driving anywhere in India, but particularly in big cities like Madras and Mumbai, is definitely a spectator sport. When we were in Mumbai, we got around in old Fiat taxis (shown under emergency repair to the left---you can also see that the driver took this as an opportunity for a siesta) that are the Mumbai equivalent of an autorickshaw. Although I have an international driver's license, and can apply to get an Indian driving permit, the choreography of the roads is more than I care to tackle--especially considering the British practice here of driving on the right-- and I'll probably limit my time behind the wheel to test drives of our vehicles on the track. Many foreigners do drive, but our international service policy discourages it for safety reasons. A few months ago, the U.S. commercial attache was practically killed doing so---ironically on his very last night in Madras--and spent a few months in a hospital in Singapore. My inclination was further confirmed by what the law of averages dictates is an almost inevitable occurrence here--an accident. Yesterday Marty and I were in a fender bender with a big blue tourist bus. The bus tried to cut our driver Antony off as he was driving on Mount Road, a main thoroughfare here. An argument ensued between Antony and the bus driver, who of course proclaimed innocence. Antony and a nearby street cop showed the bus driver the damage (blue streaks from the bus along the rear door, the trim above the wheel sheared off, etc.) which could not have occurred if he hadn't hit us. Another cop arrived, we called the local government affairs person at the plant for what to do, and more heated conversation in Tamil ensued (out of which I could only pick up words like "you" and one that could only mean "stupid." ). All of this took about an hour and a half, but on the counsel of our government affairs person, we ultimately we drove away, Antony in a considerably more sour mood than he usually is anyway. Fortunately there was no other body damage and no injuries to any of us. It does, however, prove the #1 rule of the road here---stay clear of anything bigger than you. Marty and I spent Rosh Hashanah in Mumbai, attending services at Knesset Eliyahu synagogue in the heart of the city. Above you can see Marty standing in front of the shul, which is one of several--not all of them operating-- in Mumbai. It is located in the Colaba district, which is in the south part of the city near the Taj Mahal hotel (too rich for our blood--we stayed at another nearby that overlooked the promenade). There were only about 15 people at the evening services (and only a few more the following two days), but numbers had not deterred elaborate preparation for the High Holidays---the entire synagogue had the overwhelming odor of freshly applied paint. Nor did the small turnout diminish the hospitality shown us and other visitors. On the spot, one of the elders of the synagogue community, Freddie Sopher, invited us, another couple from Israel, and three travelling Danish college girls to his apartment for the first night's dinner. A total of 14 people joined the meal, including others from the Mumbai Jewish community. We climbed three long flights of stairs to Freddie's apartment, located on the top floor of a building mixed with neighborhood shops a few minutes walk from the synagogue. Typical of a Jewish meal anywhere in the world, the food--mostly vegetarian but with a fish course-- just kept coming and coming. Between courses, Freddie's "man" as he calls his servant, plied us with Johnnie Walker Black and Hennessey's. 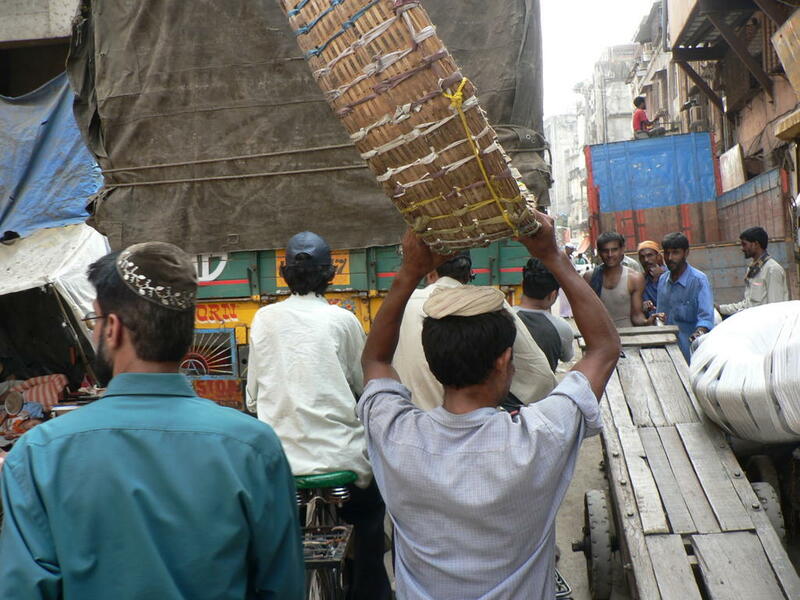 The Jewish community in India, which once numbered nearly 40,000, is down to fewer than 5,000 today, primarily due to mass emigration to the State of Israel, the U.K., and the U.S. since Indian Independence. Most of the remaining Jews are concentrated in Mumbai, but are of two distinctly different communities---the Bene Israel, who trace their history in India to the first century, and the Baghdadi Jews, who are much fewer in number but have a stronger physical presence---schools, libraries, and the larger synagogues were built by them after the arrival of David Sassoon in the 1800s. (A third group, the Cochin Jews, live further south of Mumbai in the state of Kerala, and are also very few in number). Knesset Eliyahu was built by a descendant of David Sassoon, and most of its regular members are from the Baghdadi community. Each member of the community that I talked to had fascinating stories of his or her family and life in India. Our host Freddie had been born and raised in Mumbai in the apartment where he still lived, but his remaining brothers and sisters had all emigrated to the UK. His grandfather had come from Baghdad around the turn of the century. A bookbinder, the grandfather struggled to make a living in Mumbai because he did not know the local language, Marathi. Freddie recounted an unforgettable tale from his childhood---one of his school textbooks had come unbound, and his grandfather offered to repair it for him. Knowing his grandfather's inability to read Marathi, Freddie hesitated to let the older man at the book. With apprehension, he finally relented. Sure enough, when he got to school and opened the textbook, the pages were every which way and it was impossible to follow. Worst of all, the teacher called on him and asked him to read! Failing even in his own family in the bookbinding business, Freddie's grandfather turned to hat making, catering to Hindus and Muslims as well as Jews. He did well in this business until the Partition of India and Pakistan, when religious tensions caused many to forsake wearing head coverings as a matter of survival. From hatmaking the family finally moved to the textiles business, primarily velvet and artificial furs used for children's toys, a trade which occupied most of Freddie's own adult life. The following two days, we went back to Knesset Eliyahu for New Year's services. On the second afternoon--after another meal at Freddie's---the cantor, Bennie Dandekar, took us around Mumbai to visit the other synagogues. Although Bennie is the cantor at Knesset Eliyahu, he is from the Bene Israel and not the Baghdadi community, and he also serves as an educator, bar mitzvah tutor and purveyor of kosher meats and baked goods. 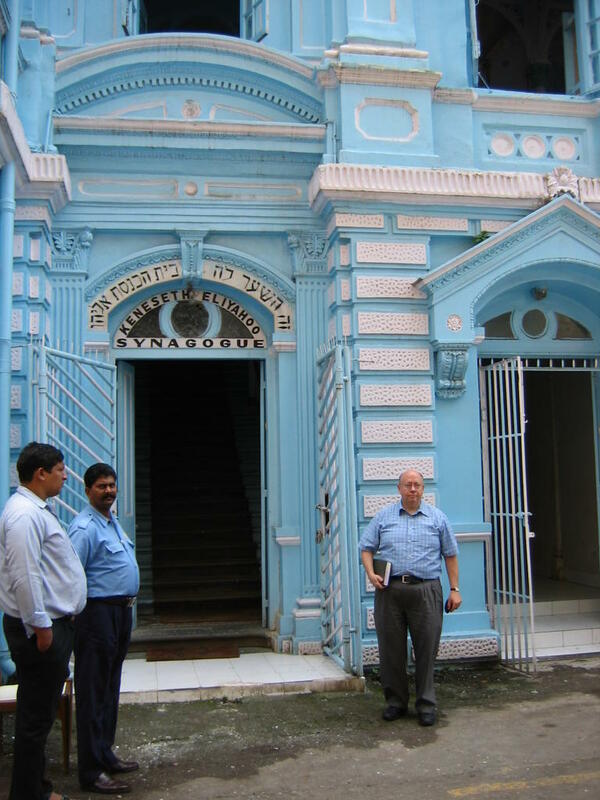 Most of the Bene Israel attend synagogues in the northern part of Mumbai. These are not nearly as ornate as Knesset Eliyahu, but have larger congregations. Some, in varying states of disrepair, are tucked away in congested neighborhoods, accessible only by traversing narrow streets filled with laborers manhandling overloaded pushcarts, taxis, trucks, bicyclers, and pedestrians. It is clear that the city's once thriving Jewish community has a rich history and, despite its shrinking numbers, still provides both warm hospitality and an unforgettable experience for visitors. 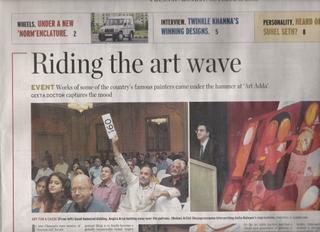 On Friday night Marty and I went to a charity art auction at the Taj Coromondel sponsored for the Rotary Club that Marty is joining. 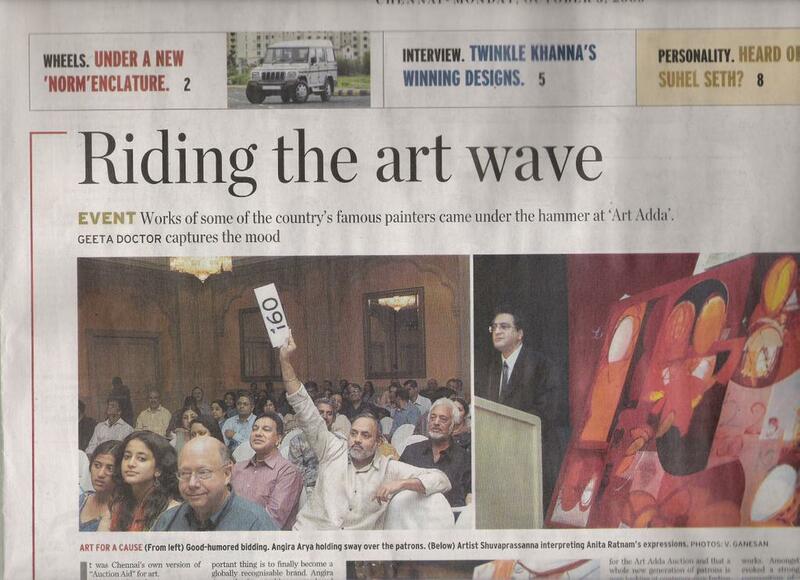 Fifty one paintings were were put up for bid from leading artists around India. Most of them started at the equivalent of $1000 USD or more--some up to 1 lakh (about $2200) and were bid up to well over $5000 USD. While the art was interesting, none of it really grabbed us especially at those prices (albeit these were somewhat inflated since it was a charitable event). It was, however, a very nice gathering attended by a number of the local machers (movers and shakers, if you don't know Yiddish). 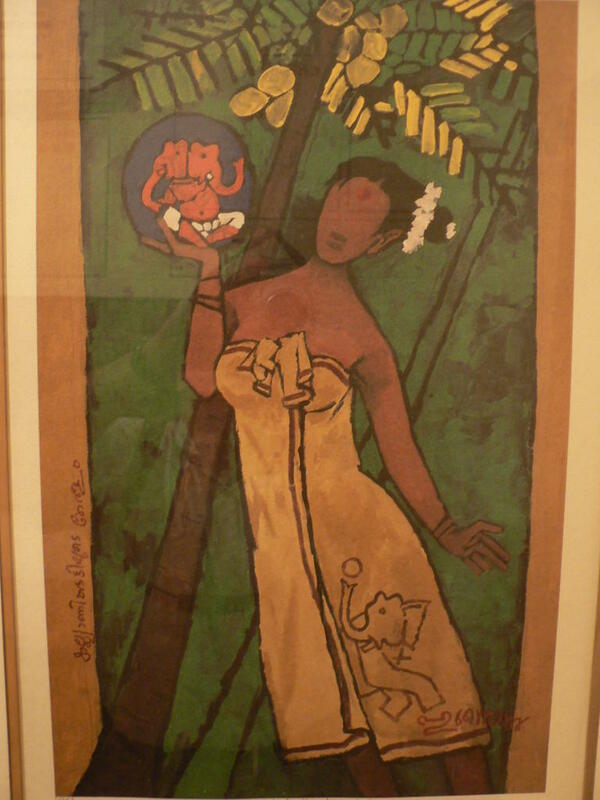 While we didn't buy anything at the auction, it did stimulate us to go back to our favorite art gallery here in Chennai, Lakshmi Ethiraj. 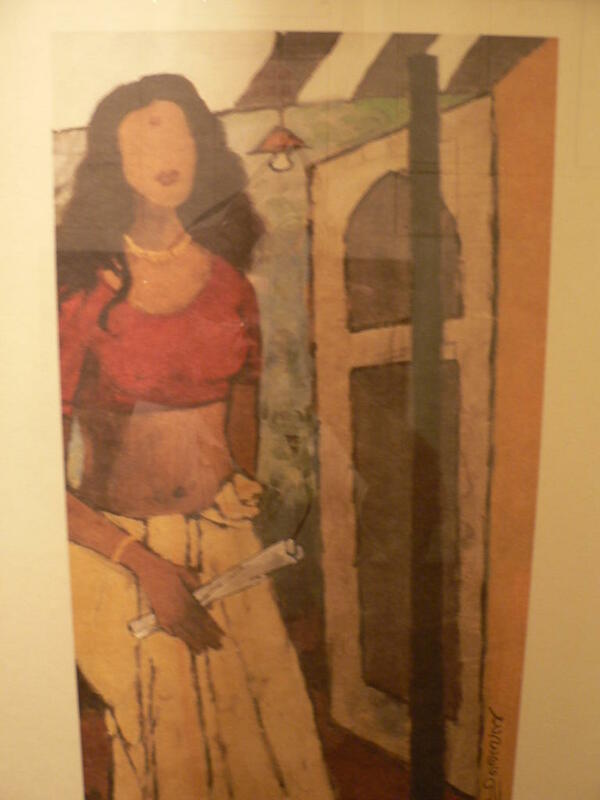 Their eclectic collection ranges from artists who are just starting out to those of India's most famous, such as M.F. Hussain. 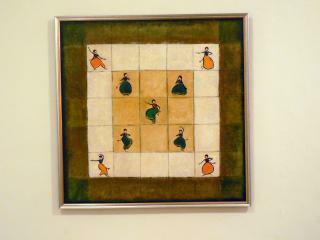 http://www.mfhussain.com/. 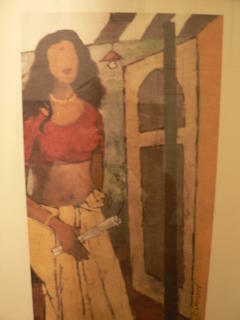 The last time we were there, we bought two prints from his limited edition series on Kerala (shown below). Today's exhibit featured three women artists who are members of the finance department of a local university. 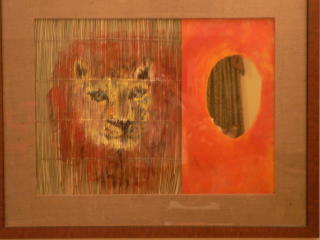 Their works were unusual and very reasonably priced, so we succumbed to buying three more pieces. In addition to the lion painting above, we bought a wall hanging themed on the Hindu wedding ritual of the sapta-padi, or the seven steps that the bride and groom take together that are symbolic of the shared journey they are about to begin. 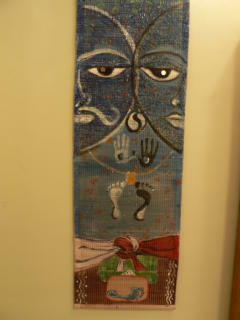 The hanging is the culmination of this, showing both the bride and the groom and the hands and feet symbolic of the custom. 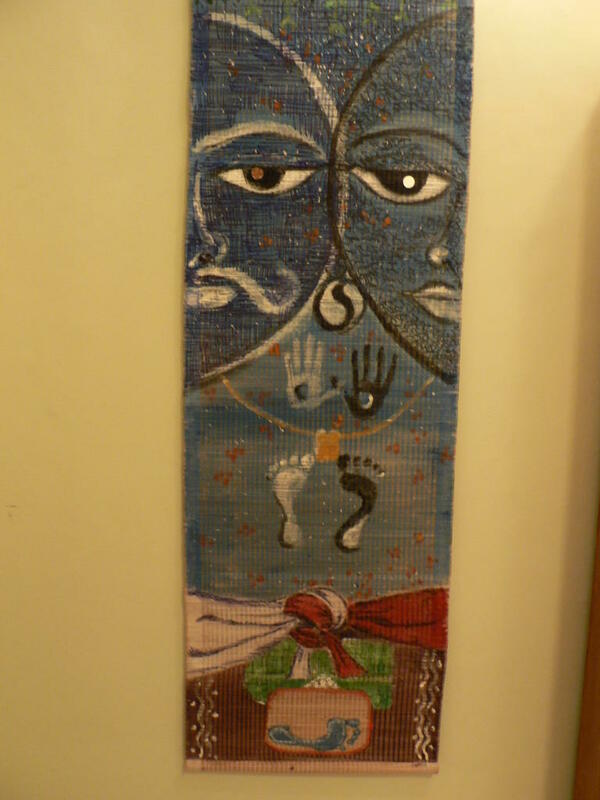 It was part of a trip-tych of seven scrolls, and we felt a bit guilty about breaking up the set, but the lady at the gallery assured me that the artist would happily make another. This artist draws on bamboo. On the left of the lion painting, which is by the same artist, you can see a small mirror--this is her way of including the viewer in the painting. 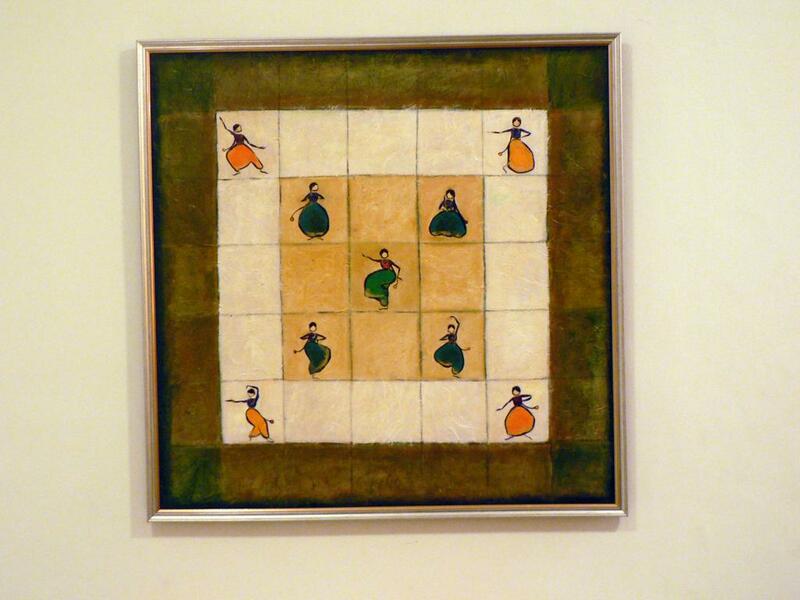 Below is the work of one of the other women, who mainly paints dancers. Even at this distance, you can see how well she has captured motion. With all this local talent, our art collection is sure to keep growing while we are here!